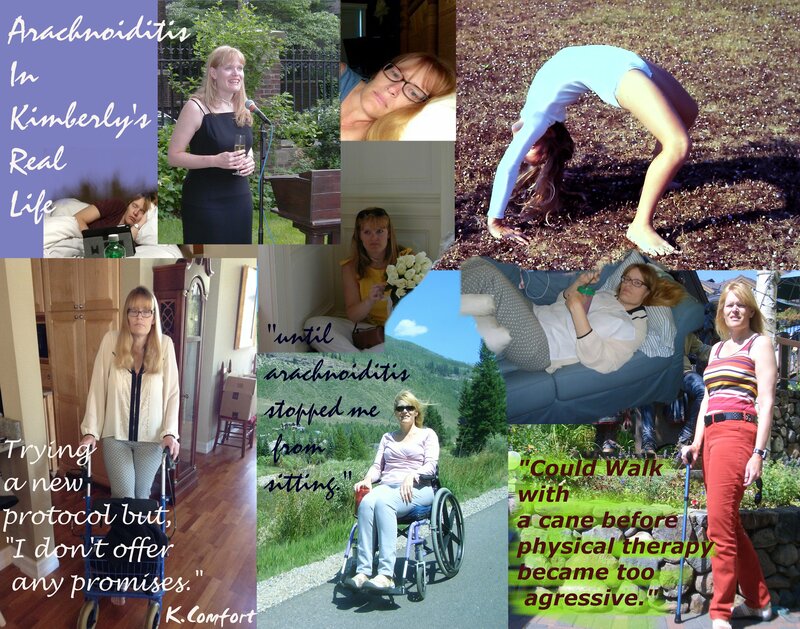 Kimberly is the next Arachnoiditis Survivor Portrait Project recipient. Fighting and surviving medical harm and back pain her entire adult life, she shares her story with us to increase awareness and prevention efforts. “Okay, I wish it was a short story, but it is not. At age 13, I started on the first day of school with severe hip pain,. My Mom picked me up and we went to the military clinic. They took about ten X-rays and said nothing was wrong. We went back every day for about a week. Then we gave up and went on to Andrews AFB, where they said it was in my head from moving to a new school. I was told I was fat and needed to exercise a lot. We then switched to Bethesda Naval Hospital and, still for three more months, multiple X-rays and all types of daily PT including electro acupuncture, biofeedback and self-hypnosis. They still found nothing wrong. At the fifth month my Dad was being dropped off at the top of the street and saw me three blocks away crying, sitting on a protector on the road for cars. He came down to me. I lived a football field away from school, and I was still three blocks from home. It had taken me two hours to get that far. At that point, Dad knew there could be no fooling around, waiting for answers. He contacted an old neighbor from the last state we lived in, who was a pathologist. That neighbor provided a referral to the DuPont Institute for Adolescent Orthopedics. That lit a fire under Bethesda Naval Hospital. They didn’t want to let me out of the military system, so they agreed to put me in the hospital the next week for a thorough checkout. I was now 14 and it had been six months of wrong diagnoses. Within three days after multiple tests, they performed a myelogram. The myelogram showed a large ruptured disc at L3-L4. The doctor came in and told me they would put me on the surgery schedule and that she was headed off to a meeting. About a half hour later, I was being rushed to emergency surgery with a central rupture at L4-L5 cutting into the leg nerve clumps. Whatever they hit during the surgery made me jump a foot off the table. I was then non-stop screaming until they got an IV hooked into me and got pain meds on board. They say the surgery was packed because they were expecting a large tumor. Once they realized it was just discs, they all left. They wouldn’t fuse because they felt I was still growing. I had a re-herniation 8 months later. In 1981 at age 16, I was fused from L3-L5 with iliac crest. In 1983, I had a bulging and frank herniation of nucleus pulpous. In 1991, my back started “clunking” with every step. I had to have a psoas muscle release to prove that it was my back that was making the noise and not an overly taut psoas muscle. From that point on, I have had to lift my leg into the car as the released psoas muscle was now too long. And the clunking continued. In November 1991, I had an epidural steroid injection (ESI), which didn’t help at all. Also in this time period I had facet joint injections which also failed to reduce my pain. By the time my Dad retired from his first career as an Air Force officer in 1986, I had a 2+ inch thick stack of X-rays. For every good X-ray, they took 3 bad ones. By the time I was 16, I was warned if I ever had a child I would need genetic testing and 9 months in bed. So, by that time I knew I would not have a child. In December 1991, I had L2-L3 fusion continuation along with disc removal by the head of Georgetown University Orthopedic Clinic, Sam Wiesel, MD. As he rarely did, he jointly performed the surgery with a renowned neurosurgeon, Dr. Arthur Kobrine, who operated on President Reagan’s Press Secretary, James Brady, after the assassination attempt. When Dr. Kobrine saw me, he said my spinal cord was too small for my body (not the only part I have been told is too small- very weird) and that it was severely tethered. The surgery they did together kept me in okay condition until 2010. I survived on Darvocet N-100, taking 2-5 daily. I saw that Darvocet as my lifeline. Who knew how much more I could and would endure. Starting in 2006, after being the family’s caretaker for an 84 year-old (my father’s mother), an 85 year-old (my mother’s father), a 94 year-old (my mother’s aunt) and a 96-year old (my mother’s mother), I decided to get as healthy as I could for me. I knew I would never meet anyone and get married. I knew my next role in life was to be the caretaker of my parents, now in their low 70’s. To get fit, the whole family walked to the beach and back every morning around 10 am. Then I came home and did Wii EA Active and Wii Dancing for 2 more hours. I did this regimen 7 days a week. No, my back wasn’t a fan, but I was determined to be fit. I knew from experience that losing weight by exercising increased pain. My family PCP couldn’t get that. He had the message that the less weight you carry around, the less pain you were in. For me, it was the opposite, since I was losing weight by exercising more. To counter the increased pain, I increased my pain pills, Darvocet, daily by 1-2 more. My PCP wanted me to go to PT to see if we could drop the pain meds back by one. I went to the intake appointment, walking the stairs, climbing slants, doing squats. At the end of the session, he had me try one exercise he wanted to start me on. I did the rep and left. By the time I reached the car, I told my Dad I was in the most severe pain I had ever been in. I immediately took two Balacet, and Dad drove home. Upon arriving home, 45 min later, I took two 10/325 Percocet and 10mg Valium. Nothing was touching this pain, although I continued taking Percocet and Valium every 3-4 hours. Like an idiot, I went back to this PT the next day, having had no sleep. I told him that the exercise he had me perform had caused, and was still causing, great pain. Nonetheless, he had me do 25 minutes of exercise. The last exercise was to be sitting on the exercise ball (something I often used as a seat when company came over and we were short on seating), sliding a foot out and then back in. Now I was in tears both physically and emotionally as I couldn’t balance. He had to hold me, and I couldn’t budge my legs. I left again. The next day I had an emergency appointment with my PCP because I could not budge either leg standing up. I could only walk in an ape position of bent knees, leaning forward. This was now September 16, 2010. My doctor increased my meds to a Fentanyl patch along with Percocet and Valium. Still little help, but I slept in spurts. My PCP also said to take a week off then get back to walking. After the week off, I returned to my normal 2-mile walk. But, now I could only walk in my gorilla position. Toward the end of the week, my father left me with my mother at a bench and ran home for the wheelchair. From about 26 October, I walked until I fell back into the wheel chair. I continued doing this for shorter and shorter distances until mid December. In mid-December, I went to Orlando to see an orthopedic surgeon my Mom had seen. He performed an X-ray, informing me that I had flat back syndrome. As a result, he stated that I certainly had pain and always would. He sent me for MRIs the next day. That Friday I saw him again. My back was so bad I got trapped in the lady’s room at his office as the door was too heavy for me to move. He sent me for a “warm and form” brace for my lower back. He then arranged for another orthopedic surgeon in his practice, specializing in physiatry, to do an ESI on me that day. This physician had previously done three shots to my Mom in a hospital setting, so that is what I was expecting. At the time, I knew nothing of the controversy of ESIs. When I showed up at his office (on a Friday), I realized it was now a cash factory. I was told to put a gown on. As opposed to Mom, who had twilight in a hospital setting with an anesthesiologist, he just started in. He numbed the skin, and stuck in the needle. I jumped a good six inches up from the table. He yelled at me to be still as he is close to my spine. I was biting the pillow in pain with tears soaking the pillow. When he was done, he left as did the nurse who told me to see myself out. I struggled to crawl to the door, where I budged the door open and cried out for my Dad for help. He dragged me to the car. When we arrived home, Dad had to get the wheelchair as I could not walk at all. By Monday, I was unable to void. Dad sent a fax boldly marked “Urgent” early Monday morning to the Orlando doctors – which went ignored. By late afternoon, Dad put me in the car, and Mom drove us all to the emergency department at Mayo Clinic Hospital in Jacksonville. Mayo performed an MRI in the ED to rule out cauda equina syndrome. They said the fact I could stand and shuffle my feet bent over confirmed that I didn’t have CES. They apparently could care less that I could barely shuffle my feet, leaning forward with bent knees. They were sending me home. It wasn’t until Dad kept insisting I could not void that they scanned my bladder. Then they cathed me, and they admitted me. They sent me home on day three, with a Foley cath bag attached to my leg, and with no diagnosis. This was Christmas week, and they appeared anxious to clear out inpatients. I followed up at Mayo with neurology and urology clinic appointments. Dad sent the neurologist a detailed paper explaining my experience in preparation for my appointment. When we got to the appointment, it quickly became clear that this neurologist had decided that my pain and inability to walk or void was in my head – the result of my use of Darvocet for many years, and now of Percocet. He conducted a brief examination. Then he had me walk down the hall. By this time, I could walk about ten feet, bent over facing the ground. He decided he could shock it out of me. He grabbed my hand and took off at a full pace. Within the first stride, I was tripping onto the floor being dragged five feet by the doctor. He then said for me to come in for a walking EMG the next day. He never had me walk, he just had me stand. It seemed that he was more interested in showing off his equipment to a colleague than he was in thoroughly examining me. When the appointment finished, I told the doctor that I’d see him in a day or two. He did not answer. I left and started crying. My Dad said I was being foolish when I told him that the neurologist was dumping me. It turned out I was right. He had arranged for me to see a psychologist that afternoon. He had given to the psychologist the task of informing me that my entire condition – inability to walk, severe pain, inability to void – was due to my years of daily Darvocet. They wanted me to go to Mayo Clinic at Rochester, MN, to an outpatient pain rehab clinic. This concept made absolutely no sense to me. Upon arrival, they would take away all opioids. During the day, they would have me in their pain rehab clinic. But, at night, where my experience informed me that my pain would be at its worst, I would be left to the care of my parents in our hotel room. I envisioned that I would walk in front of a bus in such a setting. In Daytona Beach, despite visits to a multitude of doctors, I found no one who was interested in pursuing a diagnosis. Instead, I found only a multitude of specialists who would tell me “Good news. I don’t see anything wrong. Good luck.” My PCP remained empathetic, and, thankfully, he continued to prescribe sufficient opioids that I could continue to exist, although at night, I was often crying out in pain. I only had my Dad for research. Luckily his second career was as an analyst. He spent every day trying to get help from the internet. His research suggested that I might be suffering from a peripheral pain condition, perhaps piriformis syndrome. He spent $90,000+ to bring me to California to be seen by a neurosurgeon specializing in piriformis syndrome. He performed a bilateral Piriformis resection at Cedars-Sinai Medical Center. The piriformis muscle was resection, the piriformis nerve was cut, and the piriformis muscle was left to wither in my body. After three months recovery in CA, I left in worse condition than when I arrived. I was back to total wheelchair. At my last check up, my Dad asked this doctor if I might be suffering from adhesive arachnoiditis. The neurosurgeon went into his office to re-examine my MRI. He then told my Dad that there were signs of unusual clumping of nerves, but that would indeed be a bad [unfavorable] diagnosis. Near the end of the CA recovery, on the web, my Dad found a spinal specialist at the Steadman Clinic in CO, where major athletes go to for treatment. Dad asked him about the possibility of adhesive arachnoiditis. This orthopedic surgeon said he could suggest 40 other diagnoses before he would consider adhesive arachnoiditis. This doctor seemed truly interested. He exchanged several e-mails with my Dad, inviting us to see him in CO. I went to see him at the Steadman Clinic in Vail, CO. After his PA spent about 1.5 hours thoroughly working me up, the doctor then spent about 45 minutes with me. He had me undergo a couple of MRIs using Steadman’s 3T MRI machine. He then showed us that rather than the normal lumbar lordosis, my spine had developed a lumbar kyphosis, i.e., my lumbar spine had developed wrong curvature as a consequence of my early fusions and flat back syndrome. He proposed a very major surgery, a so-called pedicle subtraction osteotomy. I had to undergo psych counseling and testing to get the surgery. In this surgery, the surgeon cut out a wedge from L4, pulled my spine back like a rack of lamb. My spine was then held in this position by curved titanium rods secured by screws into the L2, L3, L5, and S1 vertebrae. You can view a pedicle subtraction osteotomy surgery on YouTube. After surgery, I thought he had fixed me. After the surgery, I was discharged to two weeks therapy at an inpatient rehabilitation hospital in Aurora, CO, where I started walking better. Upon return to our home in FL, I attempted to continue therapy with a PT. However, the PT did not appear to follow the doctor’s prescription of going very slowly. The first PT tore both hip labrums by performing an aggressive “piriformis stretch,” despite having been informed that I did not have a functioning piriformis muscle. Subsequently, a leading hip surgeon has told me that he would not attempt labrum repair surgery because I can barely walk anyways. A second PT said I could be healed with only five exercises, as they heal everyone, which made me think he was crazy. I returned to CO and the Steadman Clinic for PT. I was there from June until September 2013. When I left, I walked with a cane, 30 minutes twice a day, and I did 30 min PT twice a day. I was supposed to continue in FL, very slowly, and use the Pilates reformer more and more. Between mid September and November, my condition slid all the way back down, plus my thoracic and cervical pain greatly increased. In May 2014, I again returned to CO to see my spine surgeon. After a CT scan, he told me that he saw nothing to correct surgically. He set me up for trials for a spinal cord stimulator. I saw a world-recognized SCS specialist, Dr. Barolat. After viewing the CT scan, he walked in and said that there was no way a SCS would help my lumbar pain, but he thought a peripheral nerve stimulator (PNS) could help my thoracic and lumbar pain. He did the PNS trial. He had me stop PT with my CO therapist while I underwent the trial. At the end of the trial my pain meds were less, suggesting that the PNS was helping, but only in the thoracic part of the spine. It didn’t touch the pain in the lumbarsacral area where most of my pain was, so he ordered a trial of a lumbar SCS conducted by a local anesthesiologist. That doctor emplaced the lumbar SCS trial on Friday. It was supposed to be a 5-7 day trial. But they so overset the SCS intensity in the recovery room that I had to keep the SCS turned off until Monday afternoon when I could see the SCS tech again. Then, on Wednesday they removed it – effectively a two day trial. Once again it seemed like my pain pill use diminished during this trial, but once again I recognize in retrospect that for this SCS trial I had again stopped PT. In any case, I had a combination SCS/PNS installed by Dr. Barolat on 9 September 2013. After recovery from the surgery and my one-month follow-up appointment, I returned to FL. The SCS/PNS was not helping my pain. I met with the SCS manufacturer techs a couple more times while they attempted to better tune it. Eventually, I had to accept that it wasn’t helping. In retrospect, the apparent decrease in pain during the trials was due to my stopping PT and not an effect of the SCS/PNS. I permanently turned off the SCS/PNS in early January 2015. In March 2015, Dr. J. Antonio Aldrete of the Arachnoiditis Foundation reviewed my history, my symptoms, and my most recent MRIs. He did not see arachnoiditis in my 2008 lumbar MRI, but in both the 2010 and 2011 MRIs, he sees arachnoiditis in several locations. He provided a detailed written report for my PCP and us, citing adhesive arachnoiditis as the primary diagnosis. I then again contacted my Steadman clinic ortho surgeon. I provided to him Dr. Aldrete’s detailed report wherein he reviews my Nov 2011 MRI on a frame by frame basis, finding adhesive arachnoiditis. I don’t know if the Steadman surgeon went through Dr. Aldrete’s report or the MRI in a similar frame-by-frame basis. All I know is that he continues to tell me that he does not see arachnoiditis in that MRI. It’s enough to drive one to drink – if I weren’t on opioids. I can’t sit, I have had to reduce my walking from 30 min once a day down to 18 minutes, and still the pain is getting worse. I spend 23+ hours lying down. I can dress myself. I can only walk with a four-wheeled walker (aka as a rollator) as I have severely damaged balance. I have stomach issues due to narcotic bowel. This is my entire life. There is no quality. Currently, my father is donating all the equipment for all of my activities I used to do, stained glass, sewing and scrap booking and more. I have bought way to much yarn hoping I might be able to knit or crochet. I hate my quality of life. I am however trying to follow a French doctor’s protocol which lasts three years. She has conducted research into treating radiation-induced breast fibrosis. She has conducted some peer-reviewed studies showing a significant reduction in breast scar tissue by following a protocol of pentoxifyline in combination with Vitamin E. In addition, she has authored a case-study of a severely incapacitated, bedridden man due to epidural fibrosis. Following a couple of years of the pentoxifyline/Vitamin E protocol, his symptoms went away and the fibrosis was shrunk. Dad met a young woman’s mother online who had adhesive arachnoiditis. The only relief she got was in a pool. After three years on the protocol, she has improved enough to return to college. The French doctor has written to us. She is concerned that the protocol may not help me since my original scar tissue goes back many years. But, my current debilitating condition only goes back to 2010, so I still have some hope for the protocol. I have promised to do the full three years of the protocol, and I am only seven months into it. Beyond that, I don’t offer any promises. So what is the French doctor’s name? How can I follow this regime? Hi, I am not a doctor. My father came across a mother whose daughter was suffering from adhesive arachnoiditis. She had searched and searched to no luck. Then she read a journal article by Dr. Sylvie Delanian I believe of the Paris a Hospital. Dr. Delanian was studying radiation induced breast fibrosis and came up with a drug concoction that broke down fibrosis. Then there was a single case of a bedridden man with epidural fibrosis. She is one of three authors on this article. The man had severe pain and was bedridden. They measured his epidural fibrosis and after three years is was , I think, less than half. He no longer needed any drugs and was no longer bedridden. The Mom that my Dad communicated with thought that adhesive arachnoiditis is another form of scar tissue. So she felt it was worth a try. Her daughter followed the drug regimen of prescribed pentoxifilene and Vitamin E for three whole years. In the first 5 weeks her daughter got more pain. By the end of taking the meds after two years,my he caught started seeing major changes. She went from intractable pain, unable to sick, forcing through the pain to walk and the third year was the magic year for her. She is now working after going back to school. Her Adhesive arachnoiditis was about two years old at the time they started the meds that Dr. Delanian used. I am doing the same concoction. My pain didn’t get worse after five weeks. My Dad did contact Dr. Delanian and she wrote back with the three drugs she wanted the other girl to take. Her doctor would not prescribe the third drug even though they say it might get healed much faster. My doctor would not prescribe it either. And the drug was not part of the drug study. Dr. Delanian also wrote my Dad that she thought my scarring was too old and doesn’t expect it to work for me. She gave my Dad different meds for me to try. But it hadn’t been through trials and my Dad didn’t want to take any risks. So we are doing the same medications that were in her radiation induced breast fibrosis studies. If you belong to the Facebook closed groups ARACHNOIDITIS or Arachnoiditis Everyday. The papers are posted by Margaret Ovideon?? .under the files. They do not have my personal correspondence but the concept of the meds are there. Consult your doctor before trying anything as I am not a medical professional. I sincerely feel there is no help for Adhesive Arachnoiditis. 2008 failed Laminectomy, Lamina removed S1. L2. L3. L4. L5, no fusion, went down hill ever since, many procedures, injections. Water therapy was painful when walking with the water pushing into me. Was told to see a Psychologist!! No medication I refused. Learned I had Flat Back Syndrome. That is very Painful! I stood eating for years. Medtronic Stimulator 1st one, Neurosurgeon implanted WRONG! Now more Lamina removed for the Stim. Told Neurosurgeon to remove it, he REFUSED. He put the battery on my WAIST TOLD HIM NOT TO! I was getting electric shocks, pain, swollen around the battery. New Surgeon, another surgery 2hr. That Dr. found blood clots abound the battery, leads frayed, leads twisted. 2nd surgeon was livid. Went to Johns Hopkins saw another Neurosurgeon, explain to us no more surgeries. Stated caution, have to be very careful with trama lumbar. Did not have a fusion so all that is there is an empty nothing to protect spine. Than Pain Management DR. told me about a new procedure called “Coolief” can’t explain but they inject something into nerves, Lumbar. P.M. Dr. was supposed to do the Procedure he did NOT! Resident or Intern did it!!! He hit the wrongs nerves, I screamed, not like me! since 2015 never drove again. Still standing and eating. Now, Implanted is a Medtronic Pain Pump, Sept. 28th. 3 days later, spinal fluid dripping down my legs, emergency surgery to remove pump. Findings!! Culture showed, Serratia Bacterial Infection. In hospital for 2 weeks, many Drs, Infectious Disease saw me 3 times a day!! 6 months later pain pump implant. 3 medications in pump. It works not 100% but helps. I am going down hill but I finally have a diagnosis. I have lost my dignity, can’t be spontaneous anymore, pride, lonely, in the bed, out of bed, in the bed, out of bad!! Leg, 1, PAIN, spine, Pain. Walking is getting less. Look in the mirror, “is that me?” Husband overwhelmed! No family here, “friends” stoped calling. Never were friends. I could take my Hydromorphone I won’t. Too much. SO who is this French Doctor? How can I follow this regime? I need help and more about this!! Sorry that you are in need but, glad that you found us. The Art For Arachnoiditis Project cannot provide medical referrals. I will fwd your post to Kimberly to give her the opportunity to reply and/or share any additional information. ~Wishing you a low pain day. Abstract. Epidural fibrosis (EF) is a major cause of failed back surgery syndrome (FBSS), which induces disabling radiculopathy for which no effective medical treatment exists. Our understanding of the fibrosis mechanisms and our clinical and experimental results for the treatment of radiation-induced fibrosis prompted us to postulate that EF might respond to treatment with combined pentoxifylline (PTX)–tocopherol (Vit.E). 6 weeks after lumbar spine surgery, a 28-year-old man presented with recurrent left L5 sciatica without disc herniation on MRI in December 1993. From 1993 to 1997, he had unrelieved back and leg pain, which became increasingly resistant to intensive medical treatment and to a spinal cord stimulator, and confined him to bed as from December 1997. In 1998, a lumbar CT-scan showed an area of left L4–L5 EF measuring 12 mm612 mm, without disc herniation. From April 1998, oral PTX (800 mg day21) and Vit.E (1000 IU day21) were administered daily for 3.5 years and well tolerated. Clinical improvement began during the third month of treatment and continued until total regression of clinical symptoms April 2001. Lumbar MRI in November 2001 showed a surface area of residual EF half the size of the initial area. This is the first report to indicate that antifibrotic treatment using combined PTX–Vit.E may be of potential benefit in the treatment of post-operative EF. Additional studies are required to confirm this potential. Failed back surgery syndrome (FBSS) is a disabling complication related to the failure of herniated lumbar disc surgery. It is characterized by severe chronic post- operative pain, which is usually resistant to physiotherapy and pharmacological treatment. FBSS is not rare, since 3– 14% of patients undergoing lumbar spinal surgery for a prolapsed intervertebral disc suffer from recurrent painful symptoms . FBSS has various causes ranging from demonstrable anatomical lesions to psychosocial aspects of the patients. The most frequent causes are recurrent or residual disc herniation and epidural fibrosis (EF) [2, 3]. Received 24 September 2003 and in revised form 19 January 2004, accepted 27 February 2004. Address correspondence to Dr Sylvie Delanian, Service d’Oncologie- Radiothe ́rapie, Hoˆpital Saint-Louis, 1, Ave Claude Vellefaux, 75010 Paris, France. (PTX)–tocopherol (Vit.E) in a patient with progressive severe EF. A 33-year-old man underwent lumbosacral spine surgery in September 1993 for resistant left L5 sciatica due to a herniated L4–L5 disc. After an initial post-operative improvement, he began to develop gradually worsening lumbar pain with increasingly severe left L5 sciatica 6 weeks after surgery. In December 1993, lumbar MRI showed no disc herniation, and only limited EF (Figure 1a). From December 1993 to December 1997, the pain was permanent, non-impulsive and progressively resistant to medical treatment, including usual analgesics (paracetamol-dextropropoxyphene, codeine and tramadol), and neuropathic pain drugs (clonazepam, amitriptyline, fluvoxamine and carbamazepine). Three successive epidural corticosteroid injections were performed, but only alle- viated the pain for 2 weeks. Morphine was then introduced, but was limited to low doses (80 mg day21) because of a hypertonic ureteral disorder. A spinal cord stimulator (Itrel II) was implanted in September 1996, but failed to relieve pain adequately and was removed in August 1999. I just saw this today after getting notified of yesterday’s comment. If you want you can go on Facebook and private message me, if you still want to talk. I am under Kimberly Comfort on Facebook. If you don’t have access to Facebook, email me [*email address removed for security reasons] put in the RE: Renee from art for Arachnoiditis. Sorry I didn’t know folks were writing me here. I forget a lot from the pain and the meds. How are you doing now? Did the French doctors 3 year protocol help you? Is there a group for people with this disease? Cindy, I did not get any help from it, but others who AA wasn’t as old, did get relief. you can private message me at Facebook with your email and I can send you the articles and the correspondence with my father for younger and older fibrosis. We were not willing to do the recommended trial for older fibrosis because it did not have a trial.